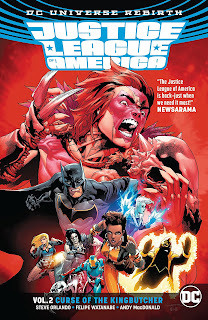 Steve Orlando's second Rebirth Justice League of America volume reminds in some respects of Keith Giffen and J.M. DeMatteis's Justice League, with purposefully B-list villains taking a backseat to the character interactions (though fortunately without the cornball comedy). I hadn't realized ahead of time that Justice League of America Vol. 2: Curse of the Kingbutcher was a collection of shorter arcs, and so it was interesting to see Orlando flit through these one- and two-offs, largely using homemade antagonists. The book felt episodic, like X-Files or one of the CW shows that Orlando's League has so much connection to. I go back and forth on Orlando's League; it has not been as good as I'd hoped and the second volume (third, including the Road to Rebirth volume) did not improve my opinion. On one hand, this book includes an astounding deep dive into much-maligned 1990s territory -- some of my favorite material -- and by the end of this volume, there's a curious mystery forming and some intriguing storylines to come outside of the book's promised Rebirth-centric, Atom-centric story. On the other hand, that reference to 1990s material makes almost no sense, part of a continued pattern of Orlando deciding this book's continuity as he goes, which along with other errors makes the book feel carelessly put together. While I like these characters, the team's internal conflict du jour is both silly and also one that we've seen many times before. I appreciate what Orlando seems to want to do with this book but a lot of this is not very original. The book's second story, "The Man From Monster Valley," sees the League rescue a feral man from the valley and rehabilitate him, only to learn that he's the heir to a fortune before he sets out to take revenge on his extended family for stranding him to start with. The story moves instantaneously from the League saving Makson to Makson, hale and hearty, holding court over the family he's about to kill. Batman, based on his reading of Makson's body language, determines he's lying and sets to investigating him, which creates a rift with the League and especially the Ray, who's angry Batman's not willing to give Makson a "second chance." Further, there's a lot of debate here about whether Batman wanted the League to be a "team" or an "army"; while fighting the so-called "Kingbutcher" later on, Ray gets in a dig that Batman is afraid of the Leaguers' powers so he's trying to control them. This debate about trust and control and teamwork is the same argument just about every creative team's been writing for Batman for at least the past twenty years or more, up to and including that this same thing is going on right now in James Tynion's Rebirth Detective Comics. The really groundbreaking thing about Orlando's Justice League would have been if he had Batman put together a team that didn't complain that Batman doesn't give them enough leeway; instead, not only are we being subjected to the same thing over again, but also the book is turning out to be the opposite of what its promising premise seemed to be when Batman recruited the reformed Killer Frost in the first place. I'm inclined to give this book an extra point mentally because it includes the severed head of a Bloodlines alien in it, which might be the most unexpected moment of the year if not for a similar deep dive in Tim Seeley's Nightwing Vol. 3. But Orlando's reference to Bloodlines and use of Terrorsmith is confusing; if we're meant to take Black Canary's lack of memory of Terrorsmith as a sign of in-story continuity issues (not that the two would have met anyway), Orlando is too subtle about it. Instead, as with a variety of moments in this book so far, it comes off as Orlando simply being careless about the continuity in which he writes -- see also Canary's reference to Doctor Fate, whom she really ought not know; that Vixen and Batman apparently seem to be long-time friends; and that the Ray apparently grew up idolizing the shadowy urban legend Batman. And as before, the continuity issues are only compounded by what seems like general sloppiness among the creative team. Early in the book, Jamal Campbell draws Ray shining, inexplicably, while Vixen talks to a group of students about meerkats (presumably art is mismatched with dialogue here or vice versa). Batman apparently leaves a room mid-conversation, again demonstrated only by dialogue. Andy MacDonald draws Vixen generating the power of an alien animal, when we've never understood she could do that; he also draws a scene of Lobo's home planet of Czarnia but with everyone looking human except Lobo. At another point, Felipe Watanabe has the League wrapping blankets around people in their headquarters, despite that there's no reason that they would have transferred the people they just saved in Gateway City over to Happy Harbor; here again, the art on the page seems disconnected from the dialogue. (Also, neither Hi-Fi nor Campbell get Batman's newly purple cape right in this book, whereas Marcelo Maiolo and others remembered it in Justice League of America Vol. 1: The Extremists). I do like that Steve Orlando creates new threats in Justice League of America Vol. 2: Curse of the Kingbutcher, and I like that these threats are smaller and more character-driven than ye olde alien conqueror in Justice League proper; this series of shorter stories serves this title well. And the idea that Batman might travel to Lord Havok's world in the future is exciting indeed -- Orlando exploring material we haven't seen all that much previously. But League remains a book ironing out its kinks, and furthermore the problems between writer and artists do give me pause about DC's proposed artist-focused line coming up.